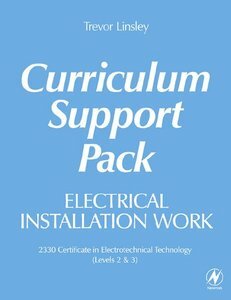 Used alongside the students' texts, Basic Electrical Installation Work and Advanced Electrical Installation Work, this pack offers an essential suite of teaching resource material and photocopiable handouts for the compulsory units of the 2330 Certificate in Electrotechnical Technology from City & Guilds, with a chapter-by-chapter match to the units of the electrical installation pathway at Levels 2 and 3. Coverage is given to the core units of the 2330 syllabus, along with the occupational unit in the electrical installation pathway at Level 2, plus the two occupational units in the electrical installation pathway at Level 3. Trevor Linsley provides the essential resources needed by busy lecturers, as well as a bank of student-centred practical work and revision material, that will enable students to gain the skills, knowledge and understanding they require.